The largest cultural complex west of the Mississippi, San Diego's Balboa Park is sometimes called the "Smithsonian of the West" for the concentration of cultural institutions within its boundaries. Originally built for temporary use during the 1915-16 Panama-California Exposition in San Diego, the buildings here are beautiful enough to be considered attractions in themselves, but the real draw is the culture, history, science, and arts held within their walls. Among its attractions are eight gardens, 15 museums, a Tony Award-winning theater and the San Diego Zoo. If you plan to visit more than one or two of the many attractions here, think about buying the Balboa Park Passport, available at any of the 13 attractions it gets you into. If you're looking for an even better deal, you can download a Balboa Park guide to your iPhone, take a free tour or get free admission on Tuesdays. Free admission is on a rotating basis, with two to five locations participating each week. Casa del Prado and Casa del Prado Theatre next door are historic reconstructions of buildings from the 1915 Pan American Exposition. Community companies that play here include San Diego Junior Theater and the San Diego Civic Youth Ballet. These fountains are one of Balboa Park's most beautiful features. This picture is taken from Plaza de Panama, looking east. When it was built for the 1915-1916 Panama-California Exposition, the House of Hospitality was the centerpiece of the event. Today's building is a faithful, earthquake-resistant recreation of the original, which was torn down in 1995. You'll find the visitor's center and public restrooms here. The world-famous San Diego Zoo is the best-known Balboa Park attraction, but it's far from the only one. In nearby Zoo Plaza, the 1910 Herschell-Spillman carousel has a menagerie of its own, all but two pairs of them ​are original. This carousel is one of the few in the world still offering the brass ring game. Nearby, you'll find the Balboa Park Miniature Railroad, a one-fifth scale model railroad, its locomotive a reproduction of the General Motors F3 diesels which pull the Santa Fe's Super Chief, and the train a rare antique with as few as fifty like it remaining. The Japanese Garden started out as a teahouse built for the Panama-California Exposition. It now covers two acres that include a Zen meditation garden, koi pond, bonsai exhibit, ceremonial gat, and a Fujidana (wisteria arbor). You can also get tea and snacks at the small cafe near the entrance. This was the world's largest wood lath structure when it was built for the Panama-California Exposition. Photographers will enjoy taking pictures of it reflected in the lily pond, but don't forget to go inside. Admission is free, and there are over 2,000 tropical plants on display. San Diego's professional theatre company, the Old Globe Theatre performs in three Balboa Park venues: the Cassius Carter Center Stage, Lowell Davies Festival Theatre and the historic Old Globe Theatre. In 1984, the Old Globe won a Tony Award for excellence in regional theatre. Starlight Bowl host performances by the Starlight Musical Theatre every July and August. At the Marie Hitchcock Puppet Theatre, you'll find the performers may have lots of strings attached. The Mingei International Museum is dedicated to the arts of the people, which is what the word "mingei" means. Their exhibits feature traditional and contemporary folk art, craft, and design. This organ pavilion, managed by the Spreckels Organ Society, was donated to the City of San Diego by John D. and Adolph Spreckels in 1914 for the Panama-California Exposition. You can see it in action during free concerts, held every Sunday. The Museum of Man is the city's anthropology museum, focused on the development of mankind and civilization. The San Diego Museum of Art holds a fine selection of European old masters, nineteenth and ​twentieth-century American art, an Asian collection, as well as contemporary and Latin American art. The Timken Museum collection includes European old master paintings, American paintings and Russian icons by artists such as Rembrandt, Rubens, and Fragonard. This view is taken from in front of the Botanical Building and if you walk straight ahead from here and turn left, you'll find the Museum of San Diego History on your right. As the first permanent Spanish settlement in today's California, San Diego has an interesting history, and this museum uses objects as varied as a pair of shoes made for the 1996 Republican Convention and an 1866 Concord stagecoach to tell its story, along with artifacts, costumes, textiles, art, furniture and photographs. At the Spanish Village Art Center, you can visit almost 40 artists' studios, see them at work and buy from them directly. The buildings and courtyards, built in 1935 for the second California Pacific International Exposition, were designed to depict a Spanish village. The San Diego Natural History Museum has been around since 1874, making it Southern California's oldest scientific institution. Exhibits here focus on helping visitors understand the evolution and diversity of the Southern California-Baja California region and range from photography and painting exhibitions to more technical topics such as the human genome. The second in Balboa Park's trio of science-oriented museums, the Fleet Science Center has over 100 interactive science exhibits, an IMAX Dome Theater and a motion simulator ride that features a comet headed for the earth. Follow the road back past the Spreckels Organ Pavilion and you'll reach the San Diego Aerospace Museum. Celebrating San Diego's aviation heritage, it caters to those whose dreams take flight, with exhibits that help visitors experience what it's like to fly a 1903 Wright Flyer, a Sopwith Camel, a P-51 Mustang, or land an F-18 on the deck of the U.S.S. Constellation. You can also take a simulated walk in space and see the real Apollo 9 Command Module. Centro Cultural de la R​aza: Preserving Mexican, Chicanao, Indigenous and Latino art and culture. They host rotating exhibits and performances. House of Pacific Relations: This group of small cottages each hosts a different nation's display offers visitors a window to their culture, history, and traditions. Marston House: A house museum that preserves a 1905 Arts and Crafts style home. Model Railroad Museum: The world's largest model railroad museum is in Balboa Park. It's popular with kids of all sizes and their annual Christmas train setup is a lot of fun. Museum of Photographic Arts: One of the first and finest museums in the country dedicated solely to the photographic arts. They feature exhibits from their extensive collection as well as works from contemporary photographic artists. San Diego Automotive Museum: Their holdings include Frank Sinatra’s 1967 Austin Petrol Hire Car and Louie Mattar’s Fabulous $75,000 Car. Veterans Memorial Center Museum: Honoring the memories of all who have served in the United States Armed Forces. Displays include historical objects, artifacts, documents, and memorabilia dating back to the Civil War. San Diego Art Institute: They put up a new exhibition of local artist every four to six weeks. San Diego Hall of Champions: The nation's largest multi-sport museum with three floors full of all kinds of sports memorabilia. San Diego History Center: Home to all kinds of displays and objects from San Diego history. 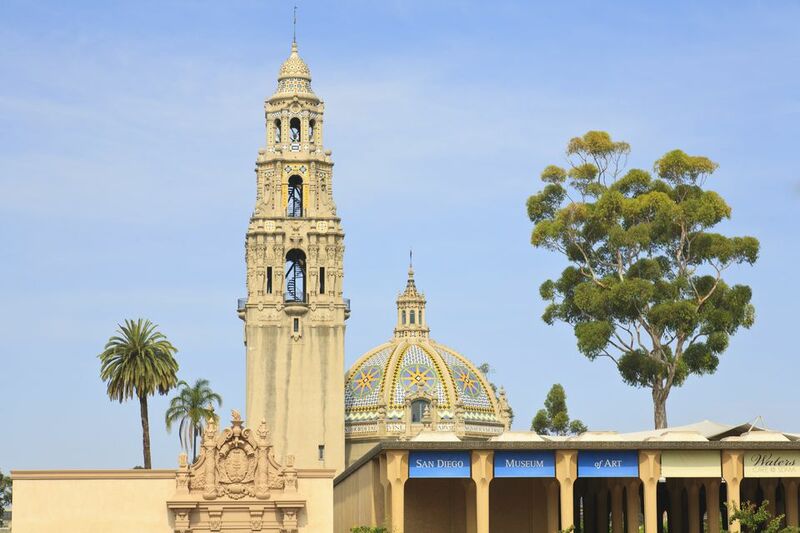 They also have one of the largest historic photograph collections in the western U.S.
Balboa Park is close to downtown San Diego, and most easily reached by automobile. You can save yourself a lot of trouble by leaving your car in the Inspiration Point lot, on the east side between Presidents Way and the Balboa Park Activity Center and take the tram, which operates seven days a week. Old Town Trolley Tours stops here as well as other sights, and it's a good way to get around town with driving and parking hassles. From southbound I-5, take the 10th Ave. exit. Turn left on "A" St. and left again on Park Blvd., follow the signs to Balboa Park. From northbound I-5, take the B Street/Pershing exit. Get on Pershing and then turn left on Florida Drive. Turn left on Zoo Place, then left again on Park Blvd.